Whether for ecclesiastical, commercial or domestic premises we provide a full consultation, design, and fabrication and installation service. We are happy to work with any ideas or designs you may have or you may choose to view our extensive portfolio for inspiration. In either case we will produce a design, or designs, based on our consultation, which can be altered or amended until you are fully satisfied. Once the design is accepted we will take any measurements and templates as necessary, make your stained glass window or leaded light, weatherproof and fit it. 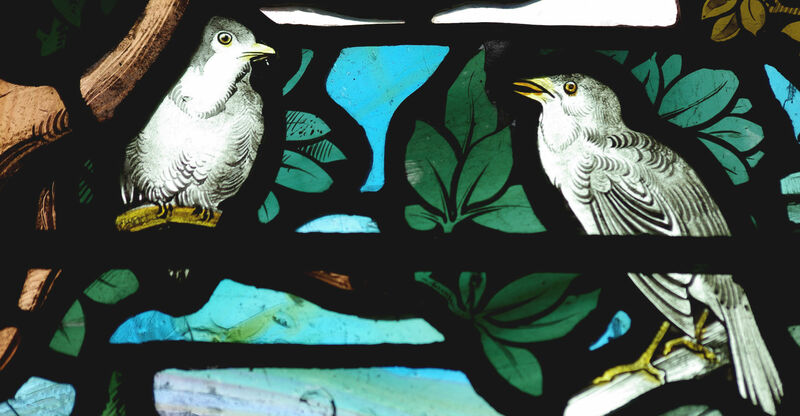 We carry out professional and sympathetic repairs and restorations to stained glass windows and leaded lights. It may be possible to carry out in situ repairs, provided the general condition of the panel is in good order. We would check the condition of the lead and solder joints, to look for any cracks, tears or deterioration of the lead matrix, looking for any excess movement within the piece and any breaking down of the leaded light cement. If all is in good order, individual broken panes of glass can be carefully removed, the lead channels cleaned out and new pieces of suitably matching glass inserted. If the broken glass is painted and/or stained, we will remove all the fragments and shards, reassemble them at the studio and make copies. The repair is then finished with blackened putty. If the condition does not allow for suitable in situ repairs the panel is removed, boarding up or temporary glazing inserted if necessary, and the panel is taken back to the workshop for repair. This could be just the careful replacement of broken panes and damaged lead, the re-soldering of any cracked joints and re-cementing, or the whole panel may require re-leading, using all the original glass, repairing or replacing damaged or missing panes, and re-building with new lead. Once this has been cemented and refitted it will be as good as the day it was originally installed. Although the techniques of fusing and kiln-forming glass have been around since antiquity there has been a resurgence of interest in this art form since the latter half of the 20th century, with compatible glasses and materials now more readily available. We can use these techniques in conjunction with stained glass or as standalone pieces of glass art, coasters, plaques, bowls etc. Glass with a thin coloured layer ‘flashed’ on one surface can be etched with hydrofluoric acid to create decorative pieces, either to enhance a stained glass design or as individual panes for use, for example, in Victorian nine-pane doors. Providing there is enough depth of rebate, any of our work can be triple-glazed or encapsulated into sealed units, protecting your stained glass from the elements and cutting down on heat loss from your premises. We can also remove your existing glass and prepare it for triple-glazing into new wooden or UPVC windows. We can provide and fit stainless steel window guards or UV rated polycarbonate sheeting, shaped to the site line of the window, to protect your valuable stained glass windows. We can provide painted repairs or new sections of painted and stained glass as requested. We pride ourselves on being able to provide new painted and stained glass of a high standard that will not look out of place alongside the originals. We are available for talks and displays in schools or community groups, whether this is a short introduction to the art of stained glass or a full day of demonstrations and instruction. Also we occasionally offer one-to-one or small group courses in all aspects of stained glass.